These two steel and glass wall sculptures hang on either side of the James Monroe sign in the lobby of the school. The sign was the only thing that remained after the fire so the placement of these sculptures there highlighted the past while looking towards the future. The owl is the school mascot and are a tribute to the entire school community. 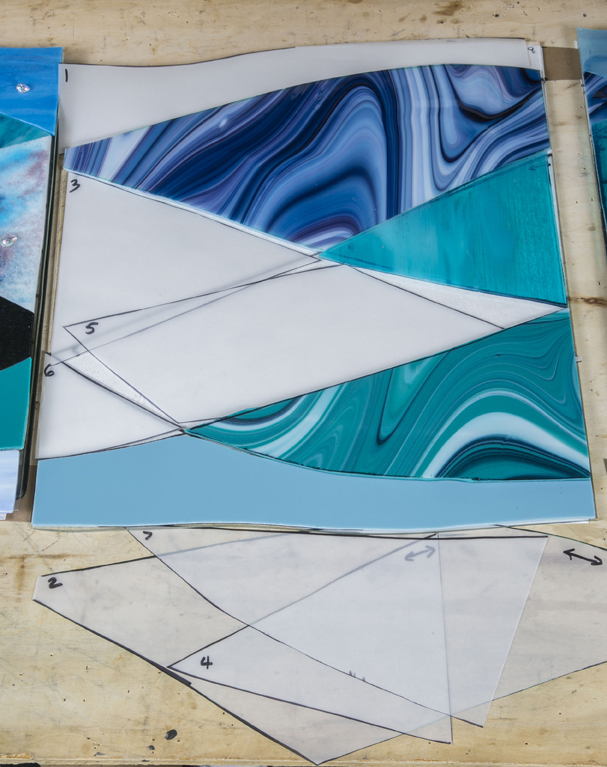 The 13 foot long river made of fused glass undulates to mirror the rises and falls of life. This is a section of it as I was piecing it together. Creating these sculptures was a collaborative effort between the Beautification Committee and me. I was honored to be selected to help them add some color and visual interest to their school and even more so to recognize the journey they had gone on as they returned to Sharp Road. For lots more photos, check out my James Monroe board on Pinterest.